Sheffield's Crucible Theatre will host the World Snooker Championship for at least the next three years. The tournament has been held at the venue since 1977, and 2017 will be its 40th anniversary. A new deal, extended by two years, has been agreed by the organisers World Snooker and Sheffield City Council. "It's really good news. We love the history of the tournament and the uniqueness of Sheffield," World Snooker chairman Barry Hearn told BBC Sport. He said organisers were committed to the city despite speculation the tournament could be moved out of the UK. Last year, the current world champion Mark Selby said he believed Sheffield would eventually lose the championship to China. The tournament, which is broadcast by the BBC and watched by an estimated global audience of 285m viewers, is worth £5m to the city. 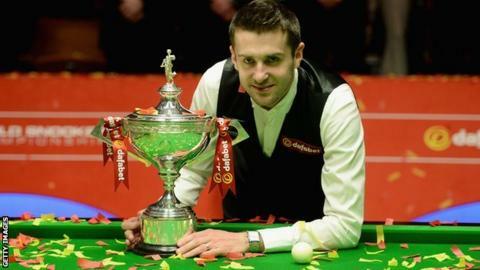 Selby will look to defend his title at the 2015 event, which takes place from 18 April to 4 May.